Immaculate Bungalow w/ numerous upgrades on a wide pie shaped lot. Located in one of the most desirable neighbourhoods w/a children’s playground nearby. 4 Bdrms & 4 Baths. Stunning open concept kitchen w/ granite counters, crown moulding cabinetry, desk, pot & under valance lighting, backsplash, breakfast area near patio doors & open concept dining room. Hardwood flooring throughout main floor. Heated ceramic tile flooring in kitchen & in 2 additional full baths on the main floor embracing granite countertops. Master bdrm has an ensuite along w/ one of the largest walk-in closets! Second set of patio doors from the Master leading outside. The backyard features a custom made Pergola area suitable for a Hot Tub if desired, surrounded by the luscious landscaping with a sprinkler system & interlocking brick. Separate spacious laundry room area located on the main floor. Lower level encompasses a large Rec room with a 3 sided Gas Fireplace. 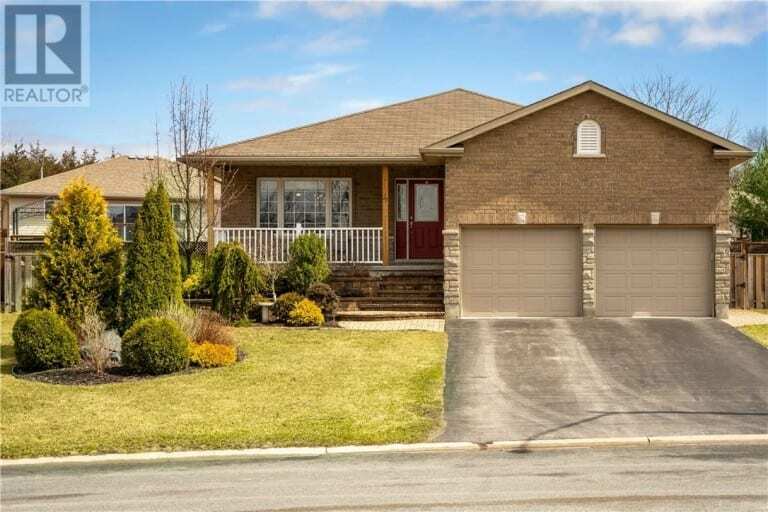 Under 15 mins to CFB Trenton & close to amenities.